Are we about to start Hatha-hating Jennifer Lawrence? a canny new article on Huffpost asks. I hope not. ‘Hatha-hating’ has prompted many a head-scratching think-piece, including on this blog. The fierceness of the phenom puzzled me. As the hate spotlight possibly swings toward J-Law, I wonder: is it a coincidence that she, like Anne Hathaway the year of her own Oscar win, recently cut her famous hair? Even before J-Law was named in the hate-fray, I wondered if somehow Anne Hathaway’s short haircut had something to do with why the lovely and talented– if occasionally disingenuous and overemotional– Hathaway has inspired such Tweet-fueled hatred that her name has now been blended with the h-word– and not just as a hashtag. Hathaway is often knocked for being stagey in her displays of emotion– and her short haircut emphasizes her ultra-expressive face with its generous actressy features. A striking look, and one that bucks the look-a-like trend of long silky extension-enhanced locks. So why IS hate-talk starting up about the famously likable and relatable J-Law– who this past year did have her own long locks sheared? Think about it. Anne Hathaway was popular star for years, and even seemed to survive her Oscar-host mis-fire whilst she sported flowing brown locks. But when she chopped her hair, initially for her Oscar-winning Les Miz. star turn, her star-power began short-circuiting. By her Oscar night, Hatha-haters were in full-throated attack. Hathaway has chosen to keep her dark hair clipped in gamin-style. Now as the first whispers begin that J-Law herself may be stumbling– or fake-stumbling, as some detractors would have it– into Hatha-hate-land, is her new short ‘do’ a factor? 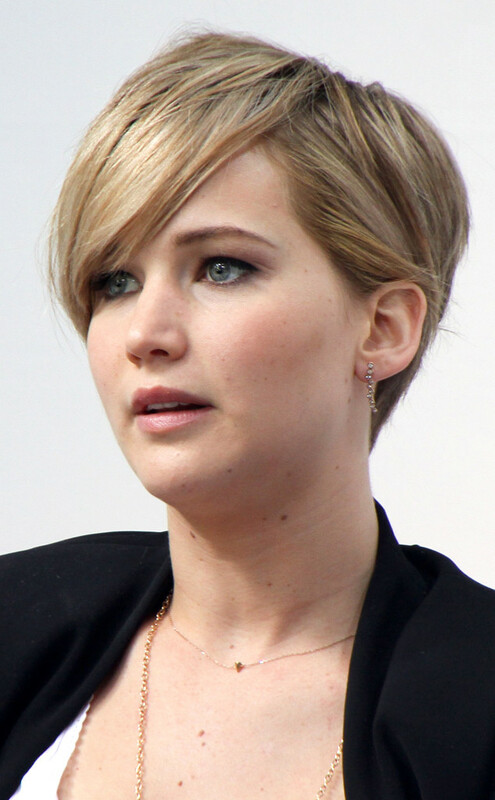 J-Law’s pixie hairstyle looks fetching to me. But does it make any difference whether short hair is flattering or not? Or whether the ‘long locks’ favored by Hollywood starlets are so often blatantly fake extensions? Jennifer Aniston recently dared to bob her blonde hair but the backlash and deliberately unflattering photos were so intense she quickly back-pedaled and appeared more recently with mira-grown lavish hair. Should Jen-Law follow the older Jennifer’s lead and grow back her mane ASAP? Are these stars or their ‘haters’ the ones who should have their heads examined? An award-winning screenwriter at international film festivals and labs, Caitlin McCarthy has written two feature films: WONDER DRUG, an Alfred P. Sloan Foundation script at the Hamptons Screenwriters Lab; and RESISTANCE, a script accepted into the exclusive Squaw Valley Screenwriters Program. Caitlin is also partnering on writing/creating the TV series PASS/FAIL with Jim Forbes, a multiple Emmy, ALMA, AP and Golden Mic award-winning writer, producer, correspondent and narrator; and writing/creating the TV series FREE SKATE with choreographer Michael Masionis attached. In addition to screenwriting, Caitlin serves as an English teacher at an inner-city public high school. For more information, please visit her IMDb profile, official Facebook page, and officialTwitter page. My favorite example is Nikki Sixx. As many of you know from my previous blog posts here, I attended numerous concerts at the Worcester Centrum growing up. I made a point of seeing all my favorite bands in the ‘80s, with only one excep exception: Motley Crue. So I settled for watching Motley Crue on MTV, zeroing in on Nikki Sixx. Whenever he was interviewed by a VJ (remember them? ), I paid attention. Even though Nikki was in the throes of a horrific drug addiction at the time, and living the life of a rock star in the worst possible sense, he struck me as a decent guy at heart. His lifestyle choices didn’t diminish his musical ability. 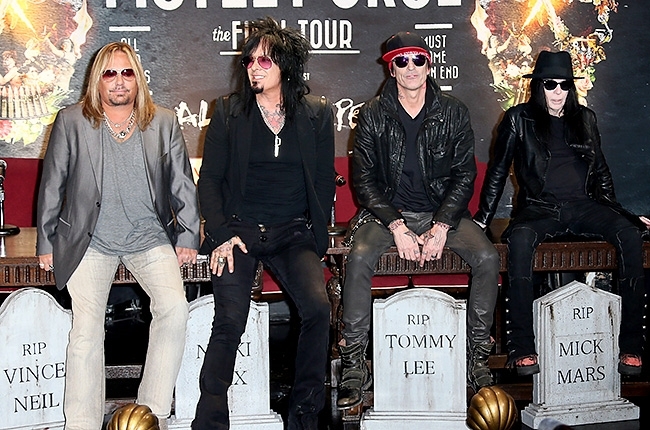 (Nikki is Motley Crue’s bassist and main songwriter.) He also came across as a smart businessman. He was (and still is) a natural, a true star. 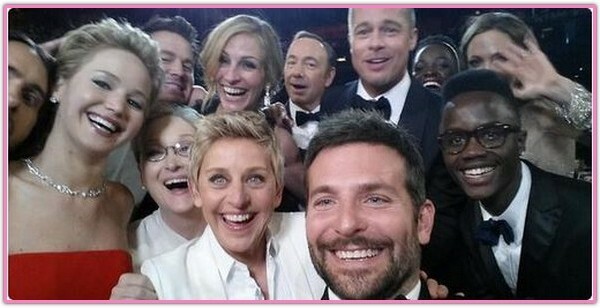 The Best Moment of Ellen Degeneres’s genial but uneven Oscar Host turn was her celebrated Celebrity Selfie shot. 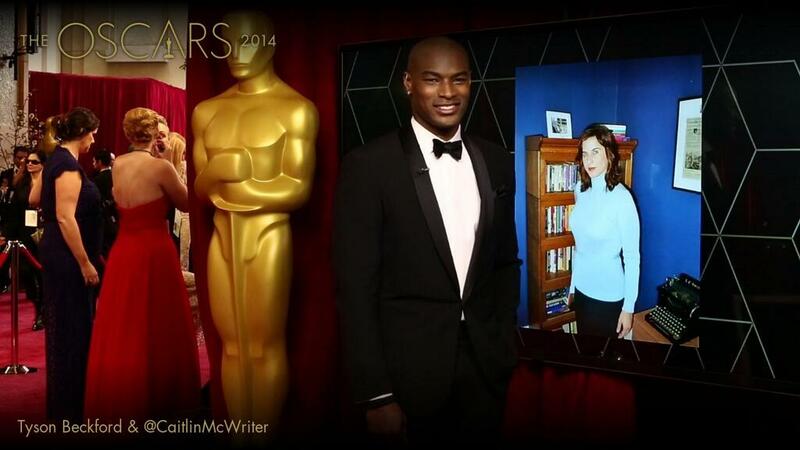 And big congrats to our own blog fave Caitlin McCarthy for appearing in a Tweet shot of her own onscreen at the Oscar’s. But antic Tweet-crashing aside, many of Ellen D’s playful ‘talk show’ techniques fell flat. The Oscar’s aren’t a Pizza Party and aren’t even a Golden Globe style cocktail party (which may be why Golden Girls Tina Fey and Amy Poehler have allegedly refused to take on the more staid Oscar). Ellen’s Pizza prank went on too long and needed more napkins. Matthew McConaughey’s wife visibly stiffened as a greasy drippy pizza slice neared her lovely pale-pink designer gown. Harrison Ford lifted his slice with the game bewilderment of a Dad at a kiddie party. Ellen D’s style works perfectly for the loose relaxed anything-goes atmosphere of a Daytime Talk Show. Similarly, David Letterman– who famously flopped at hosting the Oscars– found his Late Nite style monologue floundering with the uptight Oscar crowd. The Oscar’s producers need to embrace the formal white-tie affair that Oscar really is and stop trying to turn it into Comedy Central.